There are many impressive 3D films in the cinema. both Up and A Christmas Carol were very good. Did you mean the 3D effect or you thought that A Christmas Carol was a good film? Surely it being in the same sentence as Up refersw to the 3D only...? :p its ok, I only meant the 3D was impressive, more so then Up in my opinion... however, I did not enjoy the film... I doubt ill watch it again! Plot: Angry farmers, tired of sharing their chickens with a sly fox, look to get rid of their opponent and his family. I am a huge fan of Roald Dahls children’s books. I have read all of them and still read them today, and unlike some others of the film adaption’s based on them, I think that if Dahl was alive today he would really be proud of this one. Fantastic Mr Fox has everything a film based off such a great book should have, it’s funny, charming, unusual and most importantly captivating from start to finish. Mr Fox himself is portrayed throughout the film as a lovable anti-hero who at times had the whole cinema laughing out loud, and at other times had us all close to tears in some of the more touching scenes. This is Wes Anderson’s first animated film, and only the second of his works I have seen. I am know hoping to go back through his filmography and watch many more of his works as I have enjoyed the films I have seen of his so much. The voice acting in this film was sensational, the voices just sounded so natural and never felt forced or false and this gave the character puppets within the stop-motion animation a truly believable life around them. The film was visually stunning, with fantastic detailed backgrounds and characters, every tiny little detail from a spoon to a chair was carved for the film in miniature scale which shows how much time and effort was really put in, and it pays off. Stop-motion animation was said to be a dying art some time ago but with the successes of such films as Coraline, Mary and Max and now Fantastic Mr Fox I think it is safe to say that this great art form is safe in the filmmaking business. I only say that it was in danger of dying becuase of what I've heard. I went to see Adam Elliot (Mary and Max, Harvey Krumpet) last year giving a presentation on his life and films. I also got to speak to him briefly afterwards. It was from Elliot that I got the idea as during his talk he stated that many people told him during the process of Harvey Krumpet that he would never get anywhere with it becuase he was working in a dying art form. This was some time after the Wallace and Gromit success and there seemed to be quite a long void of stop-motion animation until it seemed to pick up again. Obviously those people were wrong however since Harvey Krumpet went on to win the Academy Award. Plot: Detective Sherlock Holmes and his stalwart partner Watson engage in a battle of wits and brawn with a nemesis whose plot is a threat to all of England. I have been wanting to see this film for a while now as many people that I know, including some on this site have been raving about it. I finally got to see it last night and I must say that I was certainly not disappointed. This film was a wonderful tale of the master detective and was told in a gritty, sophisticated and quite humorous manner in which I have not experienced Holmes before. Admittedly though I have not seen many Holmes films or shows before. I have indeed only seen one when I was a lot younger which was the 1985 Young Sherlock Holmes which truthfully scared me to death when I saw it (I was a lot younger than I am now). I love seeing films that are set in London, especially during the era of the industrial revolution and I believe Ritchie recreated this dark and grimy feeling perfectly within the streets, which for me was somewhat reminiscent of Burton’s London in Sweeney Todd which I also loved. It was not only the streets of London that were visually outstanding in this film but the set, prop and costumes designs were amazing, and in this case it was really the attention to detail that was the most vital aspects. In some scenes I almost wish I had more eyes just to stare around at all the fantastic little things scattered throughout various sets. Hans Zimmer delivers another great score for this one (seriously, does that man sleep? How many movies does he do in a year! )which makes for some great action scenes and adds a great visual rhythm to the film. I found the plot to be somewhat complicated in parts but not so much so that I didn’t understand it, merely so much that I actually had to think over things a few times before I really got them and I think that was another great aspect to the film, I almost felt as if I was trying to solve the crime with Holmes himself. All performances in the film were great, Downey Jr. delivered another fantastic role and portrayed Holmes with great intelligence as well as perfectly timed humour. The real stand out for me however was Rachel McAdams as Irene Adler. I have been a fan of McAdams for a long time and enjoy seeing her develop as an actor with each new film she does. She has certainly come a long way since Mean Girls and seems to just keep getting better with each film she does. Plot: Nelson Mandela, in his first term as the South African President, initiates a unique venture to unite the apartheid-torn land: enlist the national rugby team on a mission to win the 1995 Rugby World Cup. While watching Invictus I had the same feeling arise throughout it, and that is that while the film was good, it could have been great. A lot of the scenes in this film are very long and drawn out, and while that doesn’t usually bother me it gave this film a somewhat flat feeling for the first half. While there were some rather compelling scenes throughout the first half of the film there were not many and it really didn’t pick up until the final third of the film. Despite this I still managed to enjoy the film a lot, despite much of the story being about rugby of which I have no interest. Morgan Freeman was amazing as Mandela and the film did have some truly inspiring and motivational scenes. South Africa is a place I have always wanted to visit and I loved seeing the landscape of this fantastic country through the film, a lot of which reminded me of Australia. This film was longer than I expected but I did not find it too long. The games of rugby themselves were quite exciting despite some scenes containing a lot more slow-motion than they should, especially towards the end of the film. I think I would have enjoyed this more if I understood the political history of South Africa more than I do but I still think I learnt a lot from this film. Plot: In the Summer of 1965 a young man is filled with the life of the idyllic old pearling port Broome - fishing, hanging out with his mates and his girl. However his mother returns him to the religious mission for further schooling. After being punished for an act of youthful rebellion, he runs away from the mission on a journey that ultimately leads him back home. Bran Nue Dae is the most refreshing Australian film I have seen in a long time. Based on a stage musical (yes the film is a musical, which is something I enjoy quite a lot) Bran Nue Dae gives us something that we have not seen for a long time, and that’s a light-hearted and rather hilarious story involving Australian Aboriginals. I’m not sure if anyone here really follows the Australian film industry but I’m safe in saying that almost 100% of Aboriginal films that have been released within the last 20 years have been dark and depressing, tales of the stolen generation or petrol sniffing kids in the outback. While many of these films have been amazing you can imagine how much a breath of fresh air Bran Nue Dae is amongst it all. When the film finished one of my friends said that she was waiting for the story to turn dark and it’s serious message to come in, yet in this film it just didn’t come, which suited it perfectly. This film was fun, from the nicely animated opening credits to the final, ending song, it was a fun film to watch and put everybody in the cinema in a good mood. A lot of this I can put down to the unique directing style that Rachel Perkins brought to the film. Perkins brought to the film a somewhat eccentric way of editing, and use of sound effects which really fit the story and the characters well. Obviously this film is filled with an Australian cast, many of whom are well known here but not so well known overseas, Geoffrey Rush being the exception to this. Bran Nue Dae had fantastic scenery and landscapes and was shot in some excellent place, such as one scene the oldest cinema in Australia. I enjoyed seeing this Australian scenery in a film in that felt like a more real, unlike say, Baz Luhrmann’s over stereotyped ‘Australia’ where everything just felt to lavish. Plot: With a job that has him traveling around the country firing people, Ryan Bingham leads an empty life out of a suitcase, until his company does the unexpected: ground him. Up in the Air is now my absolute favourite film by Jason Reitman, I will find it very hard faulting this film at all as I found it stunning from the beginning to end. As far as Reitman films go I have seen Thank You For Smoking which did not do a lot for me and Juno. While I greatly enjoyed Juno I felt while watching Up in the Air that Reitman had more freedom as a director here and was really able to find his own style. One thing that really stood out to me in this film was the editing, which is not usually something I pay a lot of attention to but the editing here was amazing, there was just something almost unusual about it that gave the story a unique flow of events. Everyone in this film was amazing but a stand out for me, aside from the obvious flawless act by Clooney was Anna Kendrick’s role. I was captivated by her character throughout the film and found her performance outstanding for a young actor who has not done many films, and even more outstanding considering some of those films were the hideous Twilight series. It’s great to see a young person come out of a bad situation such as those films and suddenly prove that they can actually act, which is exactly what she did. I love a film that is heavy on dialogue but can really be carried by its words alone without ever being dull and that’s exactly what this film did. I found myself sympathizing with almost all of the characters and really caring about what happened to them which in my opinion is what makes a great film. Empire gave this a glowing review, but then those since seem to find all sorts of flaws. There's just something I really like the look of about it though. You've got me thinking again! I also saw it in the cinema recently and I liked it, too. Awesome Tom, I will certainly be watching this one again. Maybe not until it's on DVD though. Plot: 19-year-old Alice returns to the magical world from her childhood adventure, where she reunites with her old friends and learns of her true destiny: to end the Red Queen's reign of terror. I am finding it very difficult to rate this film, on one hand the visuals and performances from most actors were amazing, and made for a highly enjoyable film. On the other hand there was a few things that bothered me about it (including one highly cringe-worthy scene towards the end that made me question Burton’s sanity for keeping it in). 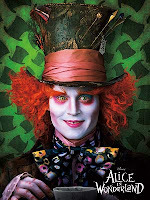 I should start off by saying that I am a huge Alice in Wonderland fan, I have read Lewis Carroll’s novels many times and have enjoyed a lot of the film adaption’s, including the animated Disney version which is still my favourite version. This Alice in Wonderland is a sequel of sorts, not the official sequel of ‘Through the Looking Glass’, but something set 10 years after that. Now for my biggest gripe about the film. The thing that I have always loved about the world of Wonderland, including most of its film adaptions is the nonsensical nature about it. The books have no plot, they are nonsensical words strewn together in a way that creates a random series of events. This somewhat ‘plotless’ plot is why I have always loved the world so much, a world in which literally nothing makes sense. In this film however there is a plot… a highly conventional fantasy plot. This is a typical ‘good vs evil’ quest ending with a final battle. This is altogether way too much predictable storyline for something that shouldn’t even have plot to begin with. That being said, I didn’t hate this film. I actually enjoyed it. Once I got over how annoyingly predictable the plot was I was able to immerse myself within the fantastic characters and world, enjoying ‘most’ of the film. Stephen Fry was excellent as the voice of the Cheshire Cat who always had an incredible screen appearance and the March Hare was one of the best characters. I have heard some complaints about Wasikowska’ Alice but for me she was one of the highlights. I think she was cast very well and was a highly likable grown up Alice. The design and animation was spectacular. The 3D was okay, although it seemed to be almost unfinished in some areas, I would actually like to see the film again in 2D to compare. The characters speak ‘Outlandish’ several times through the film which is a welcome reference to Carrolls original work. All in all I enjoyed the film, enough to see it again at the cinemas despite my complaints about it, it’s visually entertaining and has some great performances. However, for anyone here planning on seeing the film I only have one thing to say… beware the Futterwacken. I heard that this was not filmed in 3D, only added to the finished product later on. That might cause the unfinished look of it. Ah you never know, you may enjoy it, I enjoyed it for the most part. And yeah the 3D was added in later but they were very pressed for time in the completion. I saw an interview with Helena Bonham Carter about a week and half before it opened and she said that Burton hadn't finished it yet. He was definitely cutting it close.